We are ""Tokyo Tour Freaks"". 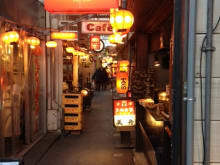 We can provide the tour - Pop on in and check out the best “bustling blind alley” of Tokyo! If you want to experience something different, our blind alley tour is the activity for YOU! Area Description: Kichijoij is conveniently located just 20mins away from Shinjuku and Shibuya station. There are plenty of fancy shops and funky people and it’s located next to big, green Inokashira Park which has a relaxed atmosphere. Naturally, Kichijoji has been ranked many time in public surveys as “The most popular place to live in Tokyo!. First, we will arrange your local journey for whatever you would like to experience. If you want, you can basically follow us around the Kichijoji area. But please tell us beforehand what you would like to experience. We can visit the bustling blind alley area after traveling to comfy Inokashira Park or vice versa. We must say that Kichijoji is renowned for fabulous takeaway snacks. Next, you can choose optional tours such as “Ramen-noodle for lunch”, “Swan-shaped boat” in Inokashira pond, “Visit famous Ghibli museum”, “famous public bath for relaxing”, or “Night pub crawling”. Some of them require reservations a few weeks in advance.. Once you make a reservation, we would be happy to chat or email regarding your plans. In short, there are many unique experiences in Kichijoj. Additionally, the place is very close to the center of the citya. I hope you will not miss this tour for enjoying the real Tokyo. We are looking forward to meeting you soon!! Pop Round & Check Out the Best “Blind Alley” of Tokyo! Thanks a lot!! Walking aournd Kichijyoji with good food and beer. English and communicate well, come back for sure!! Inokashira park was great! Really calm and relax atmosphare. Impressed cute lake side cafe restaurant and ate Thai food with So. Thanks great experience and been feeling happy during this tour! Good tour guides they are!! So and Keita have great knowlegde for Kichijoji! Historical place, blind alley, good parkside, bar hopping all good! Thanks.